The Wales Home selected the STANLEY Healthcare AeroScout Resident Safety solution because of its ability to protect residents throughout the building and grounds, with every resident carrying a personal pendant to call for help at any time. Alerts are automatically directed to staff via Apple iPod® mobile digital devices, and activity is captured in a database for analysis. The Wales Home is also leveraging the AeroScout platform for temperature monitoring of its server room and refrigeration units. 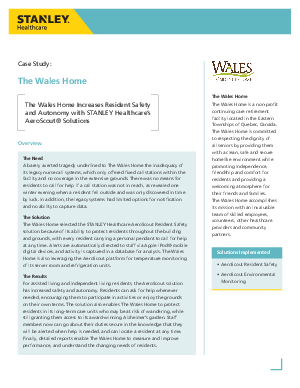 Read this case study to learn more about how The Wales Home increases resident safety and autonomy with STANLEY Healthcare’s AeroScout® Solutions.